SORCE » SORCE Celebrates 15 Years! We are thrilled to be celebrating the 15-year anniversary of the Solar Radiation and Climate Experiment. On January 25, 2003, the spacecraft was delivered into low Earth orbit on a Pegasus XL launch vehicle. This NASA satellite is carrying four instruments developed and built by LASP – TIM, SIM, SOLSTICE, and XPS. The primary objective for SORCE is to measure important solar input to Earth’s radiation budget and to relate how solar variability influences our atmosphere and climate. 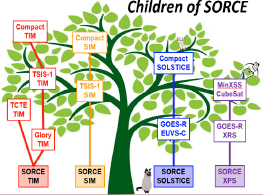 SORCE has now contributed to fifteen years of precise measurements for the important sun-climate records of the Total Solar Irradiance (TSI) and Spectral Solar Irradiance (SSI). The 5-year SORCE mission has exceeded expectations in so many respects. Its success is the product of tremendous engineering, dedicated managers and scientists, and a diligent mission operations team. There are many science highlights from this mission and mission ops has provided us with a phoenix-rebirth story several times. SORCE is poised for an extended mission out to 2019, as it gets overlap TSI and SSI measurements to continue our climate data records. Go SORCE! To celebrate this special occasion LASP hosted a reception with birthday cake followed by a science seminar entitled “The SORCE Mission Celebrates Fifteen Years” featuring talks by PI Tom Woods, instrument scientists Marty Snow and Jerry Harder, and Emily Pilinski from mission operations. The presentation provided an overview of the SORCE mission, some science highlights, and the phoenix-rebirth story for the SORCE operations. The presentation is available HERE. 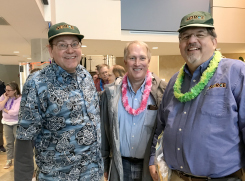 Wearing SORCE and Hawaiian attire (it’s a SORCE thing from way back – pre-launch), Tom Woods, Neil White, and Tom Sparn (left to right), enjoyed the cake celebration. Emily Pilinski gave a nice overview of amazing work that LASP Mission Operations has done keeping SORCE alive and well. Emily has been a key team member watching over SORCE’s battery status. A visual of the “children of SORCE”. Wow!